Everyone wants to have beautiful, white teeth. As you age, however, that beautiful white may turn into a tinged yellow or paler white, at the very least. It is not always necessary to rush out and try every tooth whitening product on the market, however. There could be simple reasons why your teeth are discolored that can be fixed without teeth whitening. If you do decide to whiten your teeth, you should consider having them professionally done as that provides the best results in the long run. Before you decide, however, here are some things to consider. If you have severely stained teeth, it is best to consult with us before using any whitening products. 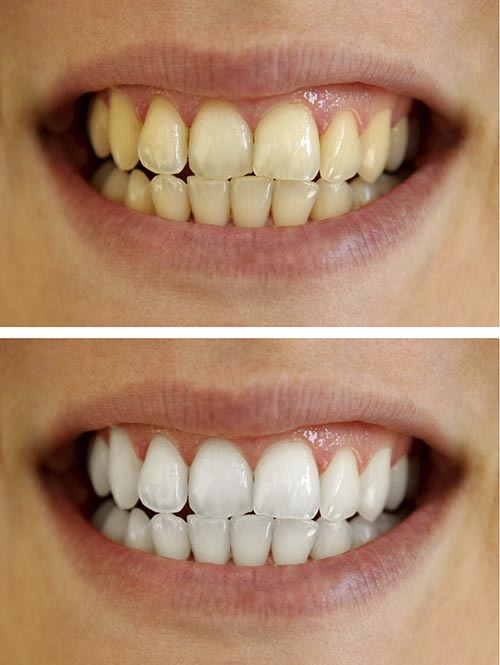 Oftentimes, certain stains cannot even be whitened. If that is the case, we could save you time and money by telling you not to try the whitening products. If you are able to whiten your teeth, you may need something stronger, such as the products we can provide in the office. The ingredients of the over-the-counter products and our products may be the same, but the strength is vastly different. If you need something stronger, opting for the in-office procedure is typically best. Teeth whitening often causes sensitive teeth. There is no way for us to predict if it will happen to you though. If you use over-the-counter products, the chances of sensitivity are much higher though. When we whiten your teeth, we protect your lips and gums from the products, which helps to decrease the amount of damage that they undergo as a result of your desire to have whiter teeth. If you do whiten at home and end up with sensitive teeth, it is important to come see us so that we can see the best way to help you. Not every tooth will be affected by teeth whitening. If you had any type of restorative work done in your mouth, they will not be affected. In addition, any teeth with certain types of stains will also not be whitened. If you are doing this process at home, you might not know what will and will not get whiter. This means that you could be left with very uneven results after you are done. If you do not want to risk an uneven appearance in your mouth, it is best to consult with us first so that we can see what your stains look like and how well they will or will not whiten. After learning about the things that could go wrong with teeth whitening, you can make a more informed decision for yourself. Even though the products that are sold in the local drugstore seem enticing because they promise you bright, white teeth, they cannot always deliver on their promise. If you start out with a consultation with us, we can help you determine the outcome of teeth whitening for you. If you are willing to take the risk, you can do the process at home, but the best bet is to have it done in the office where we can control what happens to your teeth. If we decide that you are not a good candidate for teeth whitening, you don't have to worry; there are many other options to help you get the look you want for your teeth. Please call us today for an appointment to help you determine if you are a good candidate for teeth whitening and we will help you get on the road to a bright, white smile.